Will UnitedHealth Group's Dividend Be Safe? Affordable Care Act headwinds are weighing on UnitedHealth's profit, but the company appears to be on solid financial footing. UnitedHealth Group(NYSE:UNH), the nation's largest health insurer and a staple in dividend investors' portfolios, is navigating a series of profit-crunching costs tied to the Affordable Care Act that have investors wondering if the company's dividend is safe. Let's see whether there is actually cause for concern. UnitedHealth took a conservative approach to participating in the ACA health insurance exchanges during the first open enrollment period. As a result, it has lagged competitors such as WellPoint when it comes to membership enrollment on the federal and state marketplaces. During the first enrollment period, the number of people enrolling in exchange plans offered by UnitedHealth has been a rounding error relative to the 44.9 million members the company already serves. The number of exchange members added was so small that UnitedHealth didn't even bother to break them out in its third quarter results. That's a stark contrast to WellPoint, which reported that it signed up 769,000 new members through the exchanges during the first open enrollment period. UnitedHealth's wait-and-see approach to the insurance marketplaces last year reduced its potential membership growth, but it also created a revenue headwind as people who were previously enrolled in UnitedHealth's individual and employer plans rotated to the exchanges. Those member defections caused sales in UnitedHealth's individual and employer segment to slip by $620 million year over year in the third quarter, but the ACA's impact wasn't limited to the company's top line. Affordable Care Act costs also reduced its after-tax margin by 80 basis points during the third quarter, resulting in net margin of 4.9%, down from 5.1% last year. The ACA's profit headwind resulted in UnitedHealth making fairly anemic profit forecasts for this year. Exiting 2013, the company told investors to expect earnings per share of between $5.40 and $5.60, which would be about even with the $5.50 it earned last year. However, that estimate for flat-line growth has improved over the past two quarters. Coming out of the second quarter, UnitedHealth lifted the low end of its forecast by a dime, guiding investors to expect between $5.50 and $5.60 per share for 2014. Following the third-quarter results, UnitedHealth increased its outlook again to between $5.60 and $5.65. The improving outlook stems from members' lower-than-expected medical costs and rising revenue from Medicare plans and Medicaid membership growth. The company's medical care ratio, or the amount of premium dollars paid to the company that are spent on member health care, totaled 79.7% in the third quarter, down from 81.6% in the second quarter and 80.6% in the year-ago period. At the same time, the number of people enrolled in Medicare plans climbed by 25,000, lifting UnitedHealth's Medicare and retirement segment sales by 4% to $11.5 billion. Meanwhile, the ACA's Medicaid expansion led to the number of Medicaid members growing by 965,000, which helped UnitedHealth's community and state business revenue increase by 34% to $6.1 billion in the quarter. While Medicare and Medicaid strength is encouraging, a bigger reason for optimism in 2015 could be UnitedHealth's decision to widely embrace the ACA exchanges during the second open enrollment period, which began on Nov. 15 and ends on Feb. 15. Offering insurance plans in as many as two dozen states this time around could mean millions of new members for the company, both from people switching from plans they had in 2014 and from people coming to the federal and state run exchanges for the first time. If that proves correct, and UnitedHealth prices these plans appropriately, then ACA exchange membership growth could provide significant revenue and earnings tailwinds over the next year or two. That revenue growth could help bolster UnitedHealth's already solid balance sheet. As of the third quarter, the company had roughly $9.2 billion in cash on its books. Investors should also be encouraged to learn that UnitedHealth's cash dividend payout ratio, which measures how much operating cash after capital expenses and preferred dividends is used to pay for common dividends, stands at just 24.45%. 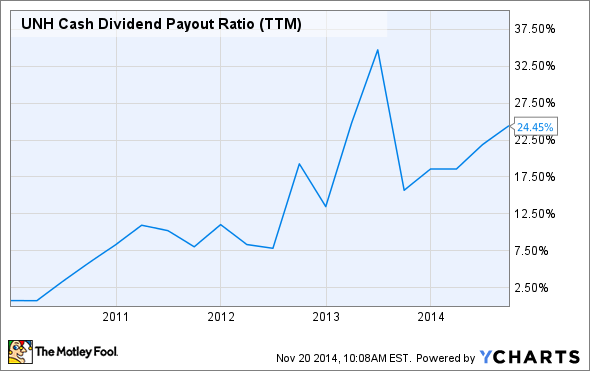 That suggests the company has plenty of room to pay (and potentially increase) its dividend. UNH Cash Dividend Payout Ratio (TTM) data by YCharts. UnitedHealth's status as a health insurance Goliath enables the company to produce significant shareholder-friendly cash flow every year, much of which is returned to investors through dividends and share buybacks. During the first nine months of this year, UnitedHealth paid out more than $1 billion in dividends and another $3 billion in the form of share repurchases. With UnitedHealth's membership set to grow through Obamacare exchange enrollment, aging Americans' demand for Medicare plans, and more states adopting Medicaid expansion this year, the company's robust cash flow and a shareholder-friendly track record suggests there isn't much risk to its dividend anytime soon.